Entirely on her own, Curly asked me to turn the Book 2 violin CD on the stereo. 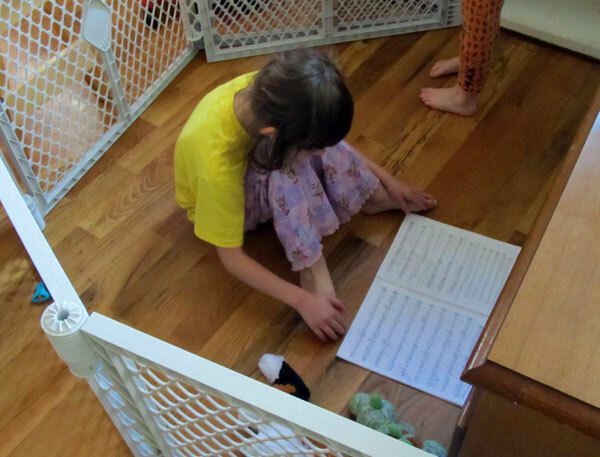 She then pulled the book of music off the piano, and took it inside the fence where the baby could not swipe it. She has been sitting in there happily singing along, commenting on the composers and following the music for each piece. For half an hour, she has been absolutely fully engaged in her learning, practicing sight-reading skills, listening for major and minor, commenting on the keys of each piece, and identifying elements such as a Grand Pause. I intended to write a long blog post detailing my thoughts on child-led learning, but I haven't gotten to it. (My Mother's Helper is absent this week, and I sure miss her!) But what better way to show the benefits of child-led learning than this vignette? Rather than pulling Curly away from something else she was engaged in, I allowed her to choose the time and place of her learning. She chose something she is interested in exploring, and rather than having to force her to focus and concentrate, she is by choice completely immersed in it. Even her brothers cannot pull her away from her music this morning. For this reason, I'll have little need for forced review or reteaching of what she learns this morning. She is internalizing the information to a depth she would never accomplish if it wasn't her idea. One of these days, I'll write the post on Child-led learning, answering the many objections to it, such as "what if they never choose to learn math?" For now, though, I am too busy watching learning in action to write much philosophy! That's great! Did she learn most of her musical knowledge from her Suzuki lessons (isn't that what you guys did?) or from you guys? Love snapshots inside your learning and loving at home!